Ioffersuper 8 Pcs Different Pattern Classic Hand Polished Horn Original/Retro Stick Hair Pin For Women Lady,Pattern Random by Ioffersuper at Beauty Sols. MPN: unknown. Hurry! Limited time offer. Offer valid only while supplies last. Description:A beautiful hair fork, buffalo horn material carefully polished polishing materials, fine workmanship, hard texture, delicate jade. A beautiful hair fork, buffalo horn material carefully polished polishing materials, fine workmanship, hard texture, delicate jade. Colour and lustre is clear and transparent, feel is excellent , so it GLIDES BETTER THROUGH THE HAIR and cause no static electricity. Chinese traditional hair accessories, meaning auspicious and peace. 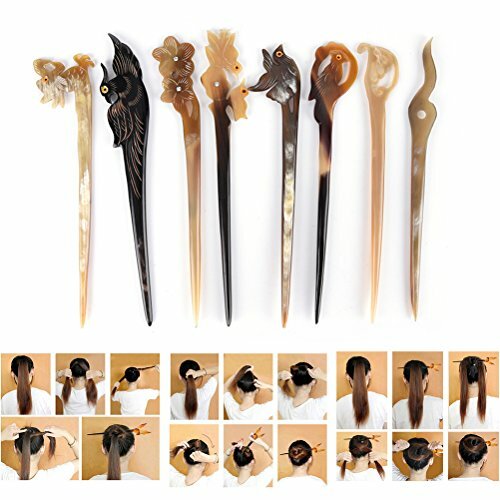 An excellent hair stick for you to wear in party, festivals or in daily life. If you have any questions about this product by Ioffersuper, contact us by completing and submitting the form below. If you are looking for a specif part number, please include it with your message.